It has been quite a while since we last visited The Good Co so we decided to have lunch there last week. 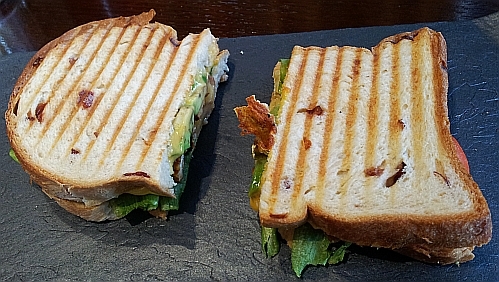 I ate the Triple Deck BLAT sandwich this time at MYR 18.90 nett. Organic cranberry bread, marinated Tempeh, mild cheddar, avocado, tomato and lettuce. Tasty but pricey. 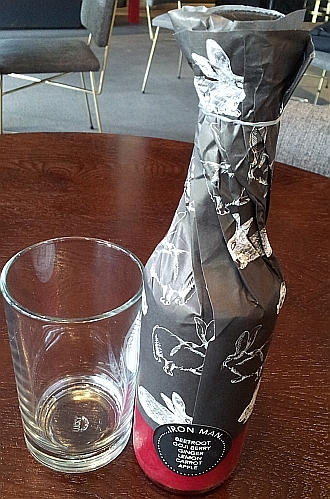 I ordered one of the cold pressed juice and it was served in a pre packed bottle and a glass was provided separately. The price is MYR 12.90 nett. This price is the usual price for cold pressed juices sold in shopping mall. 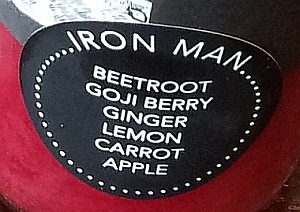 Cold pressed juice from beetroot, goji berry, ginger, lemon, carrot and apple. Very refreshing and it feels healthy to be drinking this juice. 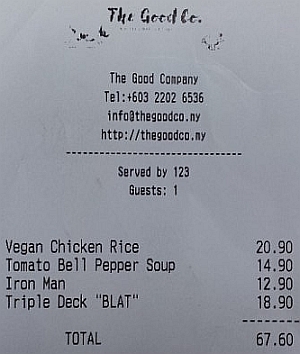 My friend had the Vegan Chicken Rice (MYR 20.90 nett) and Tomato Bell Pepper Soup (MYR 14.90 nett) just like before. Tempeh is made from soya beans so it tastes like nuts to me. I think you will not dislike it if you summon up enough courage to try it. Oh my! Those sandwiches look absolutely gorgeous!!! Wow. That's a huge sandwich. Erh, not so big in real life. Hahaha, be politically correct is good. Never had tempe served this way. 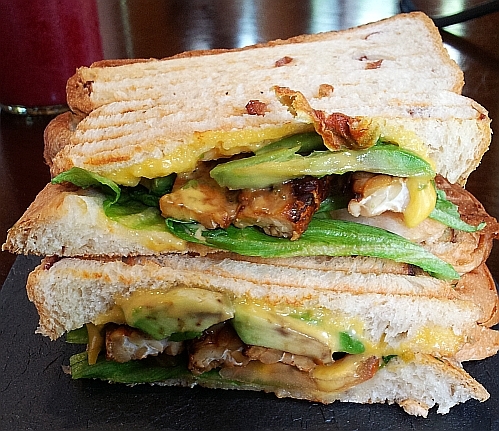 Tempe and Avocado do taste good together. The toasted sandwich is nice with char-lines as patterns. I love to drink such healthy juices with so many fruits blended together. when toasted like that need to eat immediately or else it will turn soft. I would love the sandwich that you had since I enjoy tempeh and avocado. Never thought of this combo in a sandwich. Try to make one at home to try if you like it, ok? That is one jumbo sized sandwich! Did you finish the whole sandwich? It is not that big in real life. There are two stacks so I ate one stack and kept one to eat 3 hours later. Pricey lah. And I don't like tempeh so definitely will stay clear of this. Is there a specific taste to tempeh that you don't like? Don't like the whole thing haha. The smell the texture.